UPDATE: 4/13/16 - As discussed at the April 10th monthly singing, Dan Brittain has agreed to conduct a two hour introductory singing with a short review for new singers with a question and answer time on Friday evening, April 29th, in the St. John's Parish Hall from 6:30 until 8:30 P.M. 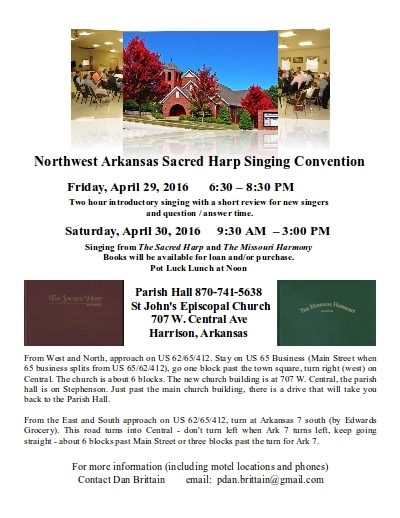 This is an opportunity for new singers as well as existing singers to learn more about Sacred Harp singing. Experienced singers are invited to help anchor all the parts. 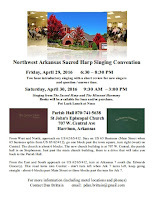 The Northwest Arkansas Convention will be held on April 30, 2016 from 10:00 A.M. until 3:00 P.M. St. John's Episcopal Church in Harrison, AR with a pot luck lunch at noon. We also have access to the kitchen for cooling or warming your special dish or dessert. Please print and share the flyer with a friend that might want to learn more about the singing school and convention. Visitors, new singers and children are welcome. We've also added an interactive Google search that lists Harrison motels/hotels, their current prices, ratings and a map. Click on this link for the list of hotels. It's another good place to sing in Arkansas. Like many people, I've been up to my 3-ring notebook with bank accounts and envelopes of receipts working on taxes. If you need a break from doing your taxes, come sing with us at the General Store on the grounds of the Shiloh Museum of Ozark History on Sunday afternoon, April 10th, from 1:30 until 4:00 P.M. If you're a visitor, or a new singer, we welcome both categories and you can listen in, tap your foot, and we'll loan you a book so you can join in if the music moves you to sing along. I should also mention that young and old are welcome. Even our most experienced singers were new singers once upon a time. If you get to Springdale a little early, say around 12:00 noon on Sunday, please join a few of the singers who gather at the AQ Chicken House in Springdale for lunch. Just ask for the singers at the reception desk and they'll point you in the right direction. "The singing was great both days and some strong loud singing. ...At the end of Sunday I sat toward the back and listened as they called Bill and Nancy Price and a lady from Oregon to lead and I went and asked Bill if they wanted me to lead with them and we all led 288 for our Shiloh gang." One more thing: The dogwoods have popped out and the 2016 version of springtime in the Ozarks is turning green as fast as it can. Not only can you sing Sacred Harp this Sunday, you can get a nice ride in the country to get there. That always sounds like a good deal to me.